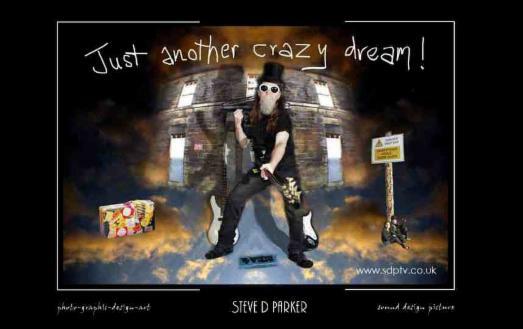 WELCOME to the Steve D Parker 2018 portfolio of photography, film and music .... enjoy ! This site is dedicated to the ANGELS of St JAMES with all my heart. Sound Design Picture, SDPtv, and Steve D Parker are made up of a collection of Steve's varied work, and is strictly governed by National & International Copyright Laws, Rules, and Legislation. No agreement or argument will be entered into. I was fifteen nearly sixteen years old when I left school, I started working as a press photographer & printer for Photopress in Leeds. I was getting deeply into music and the hippy rock scene. After nearly six years working as a Press Photographer I decided to go full time on the road, with my road mate and soul buddy, Mick Webster, he is now the manager of the Kaiser Chiefs. I tried to pursue the Music Industry as a living, but always seemed to come up short of my own and other peoples expectations. Seeing three of my musician friends die along the way and myself coming close to death on a number of occasions, on and off the road, does change one’s views on life. I packed in the road some years ago to get back into photography, where I found myself working in show biz as an independent filmmaker & photographer. Creating CD covers and Surreal Artwork, short films and recording live events and producing DVD’s. Unfortunately in two thousand and four I had a full on Heart Attack that almost killed me, I spent two days deciding what to do next, before going to St James’s Hospital in my hometown of Leeds, UK. I was about to have a second Heart Attack when I arrived by bus. After the doctors and nurses saved my life in A&E one doctor told me straight, I was about twenty minutes from death when I arrived. While I have been in much pain and mental torture due to my health and the sad loss of my Father from cancer and MRSA. I have tried to remain positive and tried to keep my mind and body active. So while doing all this I have backtracked through my life, like a jigsaw puzzle I have tried to find the missing links to what was and still is an hectic life style. I am trying to put online as much of my work as possible, old and new. The amount of photography I have done over the past thirty seven years is colossal. I also have miles of movie footage of music festivals, artists in performance, and documentaries that I have made. I have poems and song lyrics, recordings and like most artists, unfinished works. I have graphic designs I have produced and stories that I have written and still writing. Sometimes it feels that I am racing against time to complete any fragment of this mammoth task, but at the end it will have given lots of people the opportunity to look back on their life, or their city, or time, or groove, or whatever, and reflect ! ( You can read that story along with the other stories, poems and songs I have written, by following my links on www.sdptv.co.uk ).